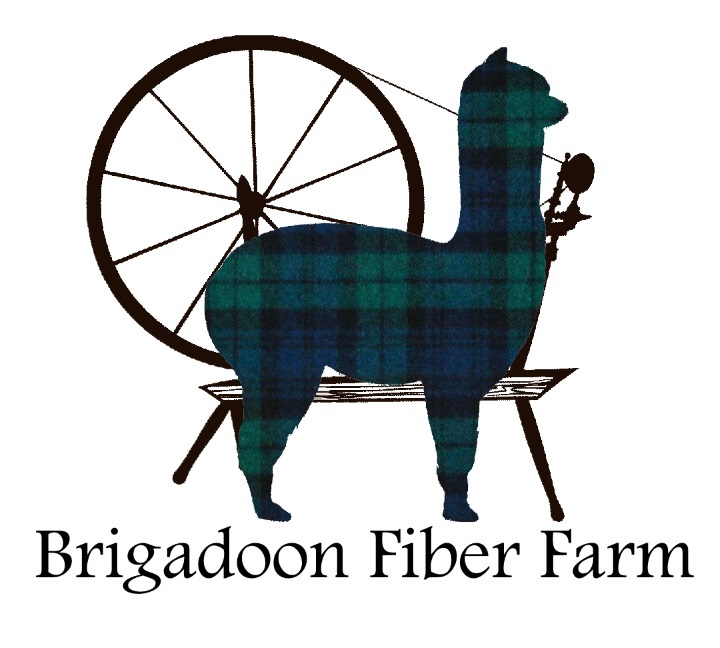 Brigadoon Fiber Farm is pleased to now offer custom weaving services. In August 2018 we added a 45" AVL loom to our farm. With this fabulous new loom we are able to weave larger, longer pieces in a fraction of the time. 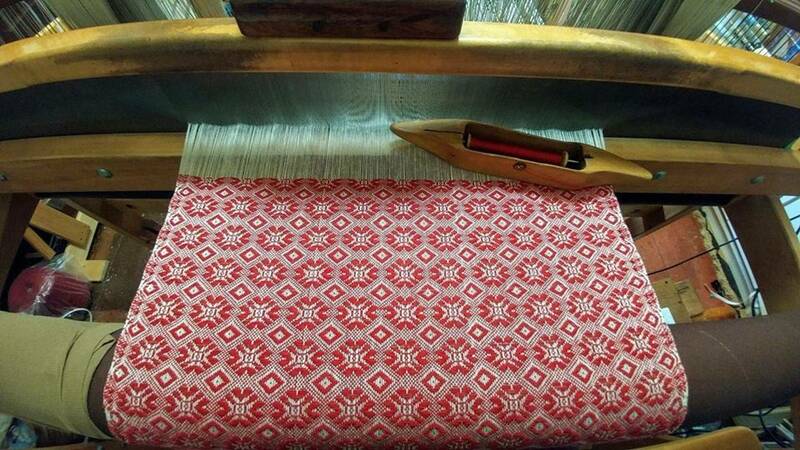 Creating custom hand-wovens for our own shop, we have decided to offer our services to other farms. 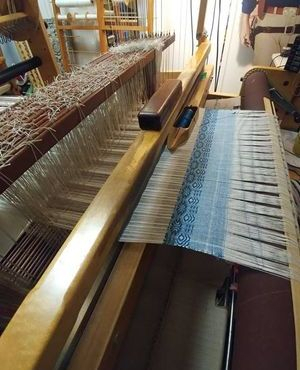 Offering hand-wovens from your own fiber diversifies your offerings and will allow you to reach a new clientele, or simply have all of the handwoven things in your own home. From scarves, blankets and rugs to yardage, we're happy to discuss your needs. All weaving is done on site, by our residential weaver. Rachel, is an artisan that has been weaving since 2014. has taught weaving both in studio and at Knit East 2017 and 2019. She is currently working towards her Master Weavers certification through Old's College. You can be sure your hand-wovens are unique and one of a kind. 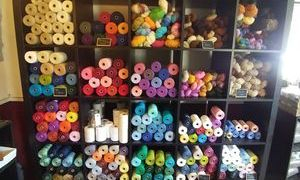 All hand-wovens that leave our studio are ready for the shelf. Washed, pressed and finely finished. Please contact us with any questions, timeframe or to place an order! Approximately 175-250g of yarn is needed per scarf, depending on fiber content and weight of yarn. 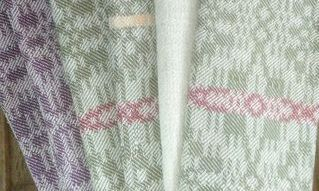 Scarf width and length will vary slightly depending on yarn type, colour, and grade of fibee. We recommend a yarn weight between 1300-800ypp. Minimum order of 5 throws $125 each 40" X 60"
Approximately 2 lbs of yarn is needed per throw, depending on size and weight of yarn. Throw widths and lengths will vary slightly depending on weight and personality of the yarn provided. Minimum order of 6 shawls $85 each 30" X 85" , 6" twisted fringe or hemmed. Approximately 1.25 lbs of yarn is needed per shawl, depending on size and weight of yarn Shawl widths and lengths will vary slightly depending on weight and personality of the yarn provided. Minimum order of 6 ponchos. Approximately 2lbs of yarn is needed per poncho, depending on size and weight of yarn Shawl widths and lengths will vary slightly depending on weight and personality of the yarn provided. Rugs are a great way to use up 2nds or coarser fibers. We're also happy to weave rag rugs. Rugs: Our studio will provide all rug warp. Although we usually use 4/8 cotton in Natural, we are able to provide it a range of wonderful colors. We can also use linen or Siene twine. Please contact for these prices. We are able to customize your rugs to the width and length desired. 10y minimum order per width ordered. We are happy to work with you to create one of a kind fabric for your needs. Custom design ensures we can work with a client from color, thread density, pattern, finishing and more. We are happy to work for historical reproduction purposes, designer needs or home décor. 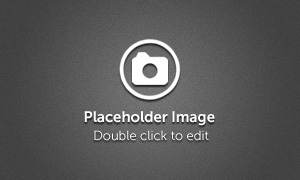 As each designers needs are unique, please contact us. Pricing is determined by thread type and more. We are able to supply threads from our studio or help source appropriate materials.  Our wholesale tea towels are a perfect addition to any artisan shop or boutique. Made from 100% eco friendly, Canadian sourced cotton and linen. All designs used in our towels are produced in house and one of a kind. We take inspiration from heritage patterns and revise them for modern application. Machine washable, these are sure to please and last many years of use. Each towel is approx. 20x27" and hand finished. We suggest retail a $40-$45 and offer them at a wholesale price of $30 with a minimum order of 20. Orders may take up to 3 weeks to fill, specific designs and colors can be requested, but designs and colors may vary from order to order depending on stock and the loom.